There are plenty of DC Comics New 52 series based on old titles long since ended, of which Hawk and Dove and Deathstroke are just two examples. 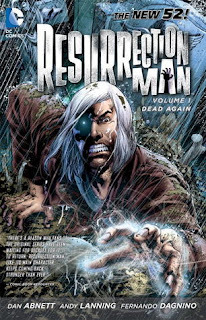 But the most successful of these so far is Dan Abnett and Andy Lanning's new take on their old classic, in Resurrection Man: Dead Again. Here's a sequel that's an exceptional improvement on the original, taking the classic Resurrection Man's core character (and even his foes, the Body Doubles) and re-imagining them in a manner that creates a more cohesive world than the original. Resurrection Man is already cancelled after its second volume, but readers have an enjoyable book here irrespective. From the first pages, Resurrection Man improves on the original by presenting protagonist Mitch Shelley as more realistic and at the same time more supernatural. On just the second page, Abnett and Lanning reveal that Shelley's resurrections actually hurt, whereas in the original series Shelley's rebirth seemed so effortless he once died over and over just to be gifted with the best power. This new Resurrection Man is a story where dying is nothing to be taken lightly, closer to what the audience imagines they might experience if they had Shelley's abilities. On the other hand, no sooner does Shelley board a plane then he's attacked by what seems to be an angel. Whereas the former Resurrection Man faced mostly science-fiction threats (and his murderous ex-wife) in the early issues of that series, here Abnett and Lanning address the metaphysics of being a "Resurrection Man" right from the first issue. Though fantastical, here again Abnett and Lanning offer a more "realistic" examination of the issues surrounding Shelley's situation than the sometime-superheroics of the original series. Equally improved are Shelley's constant nemeses, the Body Doubles. These buxom assassins, introduced in the original series, reeked of 1990s overstated costumes and stale quips, though they proved popular enough (or DC marketing so hoped they'd catch on) that they appeared on their own in a couple of one-shots and miniseries. But if their popularity is in dispute, their place in the Resurrection Man still never quite made sense; as a couple of random hired guns, Shelley could have as easily just fought Lobo. In Dead Again, however, the Doubles -- while still buxom and maybe even more sexually gratuitous under Fernando Dagnino's pen than they were originally with Butch Guice -- know Shelley, had worked with Shelley, even looked up to Shelley; even the Doubles' suggested relationship with one another has its origins with Shelley. By the end of the fifth issue, they've even become Shelley's allies to an extent, part of Resurrection Man's new supporting cast that also includes a nineteen year-old supervillain trapped in an old man's body. Dead Again is perfectly workable, without the obvious signs of what might have lead to the title's demise as in Static Shock, Mr. Terrific, Hawk and Dove, or even Grifter. If anything, Dead Again is slow to start and not terribly well-served by its first issue, which mostly involves Shelley fighting the angel-creature and jumping out of an airplane (not terribly different than the first issue of Grifter). It's action-oriented, which works for Grifter, but Resurrection Man is stronger in the second chapter when the mystery of Shelley's origins comes more to the forefront, and certainly in the sixth and seventh chapter, which are one-off episodic stories of the kind that made the original Resurrection Man series a fan-favorite. Another drag on the new Resurrection Man -- not a reason for cancellation, but a way in which the new series is lesser and not greater than the old -- is that Shelley's pre-Resurrection Man persona is surprisingly unlikable. Abnett and Lanning get credit for a deft Deathstroke cameo in Shelley's origin flashback, but Shelley as weapons-contractor-and-general-jerk is less captivating than Mitch Shelley, mob lawyer from the classic series. While the Body Doubles' role in Shelley's origin remains inspired, when Shelley lets a soldier die and then whines when he himself is injured, the audience finds him pathetic more than just "evil." That Shelley is now concerned he might one day revert to being that "bad person" is an interesting twist for this new series, but Shelley's old persona doesn't carry the true threat Abnett and Lanning might have intended. A nice touch is that, in addition to all that Dead Again adds to the Resurrection Man mythos (which before now didn't exist, but anything can happen), the book ends about where the original Resurrection Man series began -- with Mitch Shelley heading to a library to try to piece together his old life. This was logical, in the original series, which also used email and instant messaging in a kind of futuristic fashion; now, when the Body Doubles transport instantaneously through something called a Matter Hammer, Shelley seeking out a library seems (if unfortunately) quaint. If Abnett and Lanning see fit to have a librarian named Irma waiting there for Shelley, in homage to the classic series, that would be great. Mr. Terrific, again, is an example of a DC New 52 series that was enjoyable, but both art and writing were rough enough to explain its cancellation. But Resurrection Man: Dead Again is a book with no too-obvious flaws except perhaps it doesn't star a franchise character, and if it explains the book's now-second cancellation, then it also makes it too bad all the more. At least there's one more volume still to go. First up next week, it's the DC New 52 Superboy: Incubation -- and then, the Collected Editions review of Superman: Earth One Vol. 2. Don't miss it! I'm not sure if I agree with you regarding the first issue not serving the whole series, if only because as I read all the #1 New 52 issues, figuring out what I liked in the new line, Resurrection Man was one of the few titles (along with Swamp Thing) that I wasn't expecting to enjoy but ended up adding to my "buy" list. I wrote to a friend at the time about the first issue: "It wasn't perfect, but it has me interested enough to keep buying it." I was happy to find out, as I read the first volume's worth of issues, that I had made a good choice. I hadn't read the original series, save for the DC One Million tie-in (which was enough to learn what his power was), so I can't comment on the comparisons to the original version, but I agree that making the dying/resurrections painful is a great aspect of the character. It makes his power a curse as much as a gift, as well as adding weight any time he sacrifices himself (although I can't think of a specific example at the moment). Also, at some point, I either read or realized myself that his post-resurrection powers are often inspired by the way that he last died. I had to go back to issue #1 and started over, comparing his deaths to his new powers, and while it wasn't 100% of the time, it was often enough that I thought it added another cool element. I also didn't mind that he was an unlikeable jerk in his previous life. It's not that it's a fresh idea, but I think it does add a bit more to the character. Also, I wonder if this whole heaven-after-him-for-cheating-death thing will incorporate the idea that maybe he was originally a bad enough man to never get into heaven in the first place? Finally, gotta love the Ivan Reis covers, although I enjoyed the interior art well enough as well (giant aisles in the commercial airplane of issue #1 notwithstanding). If I had to guess as to why Resurrection Man keeps failing, it's that he seems to have no real connection to the rest of the DC landscape. Wolverine works so well because he's fully integrated into X-Men Lore. Resurrection Man needs that kind of anchor. Does DC have an X-Men equivalent he could join? At this point, Justice League Dark, I guess. He just screams niche otherwise. He might be interesting, but he's a niche character, and while it's great that this second incarnation (which is kind of funny to say, considering) seems to have been an improvement over the first, a third go-around would need to address the glaring lack of context he suffers. Too often when it wants to try something new (apparently even the second time) DC decides to let that character play in their own sandbox, and if that doesn't work plug them into a random team. Yes, I just recommended plugging him into a random team myself. You know what I mean. It's the kind of context Booster Gold gets from joining the Justice League. or Time Masters. That's what Resurrection Man needs. Even if a team is not the answer, then building useful associations most certainly is. DC is a shared universe. DC One Million should not be the only reference fans have concerning this character. It's not just mentioning Vandal Savage. Anyway, great concept. Hope there's the third shot available. That Mitch's new powers each time he's resurrected are inspired by the way he died gets explicitly stated (or Mitch realizes it) toward the end of Dead Again; I'm not sure if it was ever a real thing in the classic series. On one hand, this seems like a writers' crutch -- Mitch "just so happens" to have powers that affect his situation (else we wouldn't have a story) so they make it part of his power-set, rather than working to randomize the powers and still make them function in the situation (which, I grant, might be near impossible). On the other hand, I like the idea this raises that Mitch is evolving, essentially; he comes back every time with a defense against the thing that killed him. Granted he only has one power at a time, but if there were a sort of collective effect, you could posit that if he's killed enough, he'd become a kind of super-Mitch. Also I'd now like to see a fight between Mitch and the similarly-powered Doomsday. I never read the original Resurrection Man, so with the New 52, I picked up the trade of RM:Dead Again and I loved it. Your right in regards to your review. There are very few flaws in this new series, yet poor sales for an unknown character doesn't quite do it. Really said this one is going...this and Frankenstein. But considering there will be Volume.2, I think it's still well worth picking up. And on a side-note: can't someone review I, Vampire before Halloween next week? It go great with the October theme, as well the book is one of the best in the New 52. @Tony, that's a fair suggestion. Kind of built into the Resurrection Man aesthetic is that Mitch is a loner, he doesn't know where he came from, he travels from town to town, etc., and so I think it's tough to "tie him in," so to speak. But of course, this volume has Madame Xanadu, Deathstroke, and Commissioner Gordon (whom Dagnino draws as a dead-ringer for Gary Oldman); and the first collection of the original volume had the JLA, Parademons, Batman, some random DC villains, and etc., so the fact that Resurrection Man isn't "tied in" might be more perception than reality -- but a perception that I think's pretty pervasive across the fan-base. Does it come down to the old sawhorse that characters not part of "families" just won't work? I wonder if Dial H will suffer the same fate. The fan in me would love to see Resurrection Man show up over there. @Lionheart, I'm on to Superboy and Superman: Earth One Vol. 2 next week, but I, Vampire will be along shortly, and you have my permission to sneak some leftover Halloween candy while you read the review. I think the DCnU is not as much about cancellation as some books just have this certain run to tell a story. There are a few I have read that end tying up the main themes. Resurrection Man was one such title. It begins and ends with the issue of the shiny soul that everybody in the divine realms are fighting over. I like that they resolved this in an interesting fashion. It is an enjoyable story. Collected it is probably more enjoyable. I don't mind in the slightest if DC treats some series as miniseries -- they run, they tell their story, and then they're cancelled. Maybe the cancellation would seem less severe if DC would identify them as miniseries, but then maybe readership wouldn't be the same (outside guess is readers flock to new series more than miniseries) -- and with a mini, one wouldn't have Annuals, zero issues, crossover tie-ins, etc., though it would be interesting if they did that some time. My guess is that the current Batman, Inc. run is this kind of "miniseries as series," too. Glad to hear that you feel Resurrection Man ends well. I'm looking forward to the next volume. I guess what I'm trying to say is that when a relatively unestablished character appears in another book, it helps, but it should also be done properly. Booster Gold, again, came out of 52 strongly because he was an essential element of the story. How he was used in 52 also helped redefine him. Until that point, he had more or less ended up being just another superhero, even though his backstory makes him anything but. Such appearances can radically change the perspective on a character. What could someone do with Resurrection Man? It just sounds as if there's an incredibly interesting character buried under a fairly episodic framework. In two incarnations he's still just a gimmick (apparently with ANOTHER gimmick), someone who comes back from the dead and apparently a different set of powers. Me, I think I'd want to know how that relates to others. Anyway, I'm babbling. I'll stop now. Tony, you've won the Collected Editions No-Prize Award for Comment of the Day for a paragraph that mentions both Damage and Superboy and the Ravers. God, what a wonderful era of DC Comics. Now that you mention it, Abnett and Lanning did a well-regarded run on Legion; it would have been *great* to see them team the Legion with Resurrection Man. But I get your point; it seems a mistake not to let a character like Resurrection Man benefit from being part of a shared universe (I think he gets a cameo in Justice League Dark, but just a cameo). There are some, I'm sure, who would say they *don't* like that every DC character has to relate to another character and that characters can't just exist on your own, but I agree the better formula seems inclusiveness.